Modern convenience meets contemporary design. 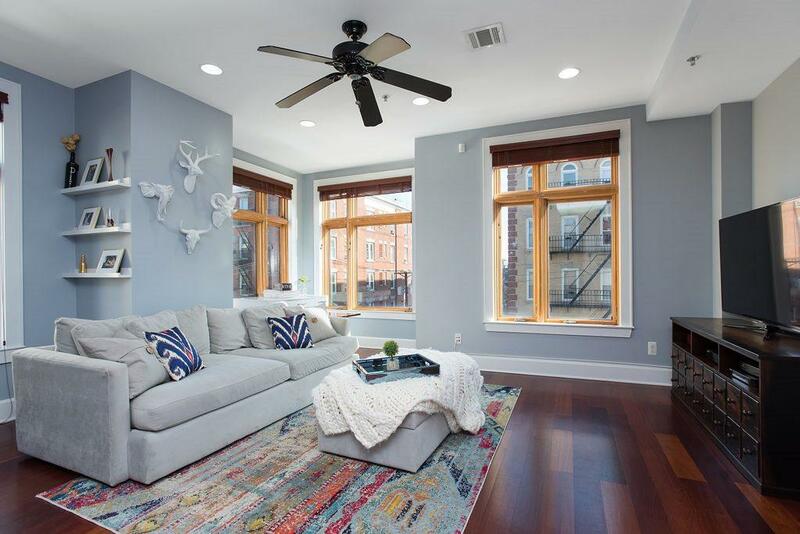 Enjoy sophisticated urban living in this well-appointed 2 bedroom 2.5 bathroom in midtown Hoboken. This distinctive home boasts 1351 square feet of living space and both northern and eastern views of Manhattan. Every detail has been thoughtfully considered in this custom 2006 built penthouse home with elevator and common roof access. Features include Artistic Tile hand painted custom kitchen back splash, Brazilian cherry wood floors throughout, 20 over sized Anderson windows with cherry wood blinds, GE profile stainless steel appliances, new Bosch dishwasher, new dual zone 46 bottle Edgestar wine fridge, 42' inch custom kitchen cabinets and dedicated full sized kitchen pantry, washer/dryer, central heat & air, recessed lighting, and 9.5 ft. ceilings. The bedrooms are both spacious with ample closet space, the master bath has a relaxing jetted tub, and the guest bath has a lovely Hansgrophe Pharo shower panel. Add in one year of free parking and this home literally has it all! Owner has a NJ real estate license.